I grew up in gardens. 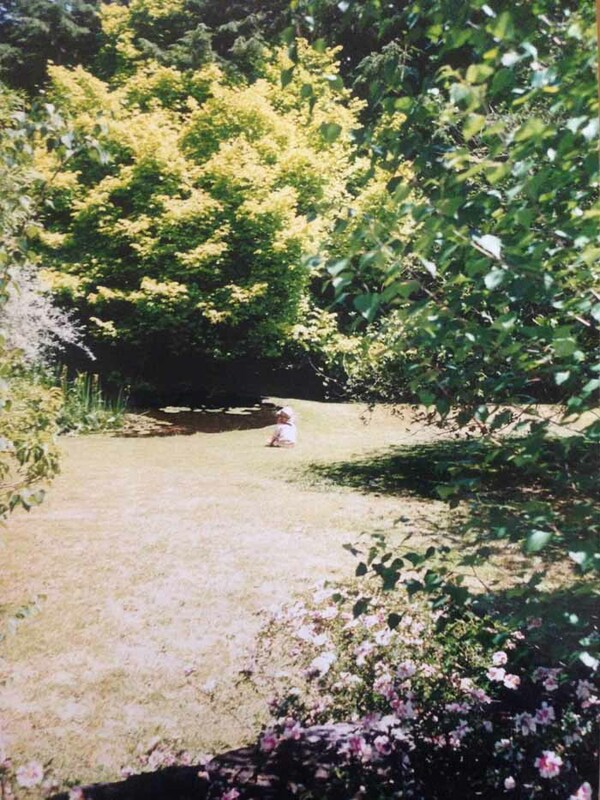 There is a photo my mum took of me, sitting in the shade of a ghost gum tree in an Enda Walling garden. I’m three, wearing a pale pink hat, you can’t see my face under my hat but I am talking to the ants, running my hands through the grass, seeing bright blue sky through whispering gum. When I used to live at home, my Canberra garden was ever changing thanks to the green thumbs of my mum and the strong arms of my father. We had a little red swing set that was wet and cold in winter, warm and wonderful in summer. A small blue paddling pool that was full of floating blossoms, which my sister and I loved but quickly grew too big for. Our garden didn’t have a fence and I remember one day a bunny from one of the neighbouring houses was suddenly hopping around and nibbling at our strawberries. We called him Henry and he visited us every week for a year. I remember I liked patting his soft fur and watching his little pink nose wriggle. I had birthdays in our garden, lemonade and fairy bread when I was little, sweet wine and olives when I was older. We always had roses, my mother’s favourite, she would walk around with a little green watering can, stroking their petals, helping them grow. There was always a pine tree branch for Christmas, there was always sun, there was always rain, there was always the green garden. Now, I don’t have a garden of my own. There is a little one at the back of my apartment building near the little spiderweb shed laundry. Sometimes while waiting for the washing machine to rock to its finish, I lean against the door, wrapped in a scarf and jumper, looking out at the garden while it rains. It’s a small place, the trees press down in a circle around my head. The grass grows long in winter and gets muddy quickly. In the summer I shake a rug out and read in the shade. I pick orchids and lavender. I buy a pink plastic watering can. I like the ritual of watering and pulling weeds. It’s not my garden, but I can sit among its quiet. Inside, slowly, the apartment becomes a garden. Every available surface holds flowers I pick from other people’s front yards on my way home. Orchids and lavender, white roses, purple wisteria. In the city, I buy little succulents planted in blue ceramic bowls and put them on my windowsill. I buy a fern in a grey stone pot, it helps the room breathe, this living, silent thing. The trees outside my open window rustle and sing in the wind. I go to picnics with friends in Fitzroy Gardens, I see people getting married, I see people lying in the sun on their lunch break, I see children holding onto the hands of their mothers, looking up at the trees. I walk through the Royal Botanic Gardens in the evening with my boyfriend, we sit in the grass and watch the city lights. I put the photograph of me at three on my bedside table, I wonder what she would think of me now and what gardens she dreamed of at night.